Preheat oven to 3500F. Toast almonds in oven for 5 minutes or until lightly browned. Reserve. In a medium saucepan heat 2 tablespoons of the oil on medium heat. Saute the rice and egg noodles for about 3 minutes or until evenly coated and very lightly browned. Add the broth, salt and pepper and increase heat to medium-high heat. Stir with a fork. Lower heat, cover, and simmer 15-18 minutes, or until cooked through and the liquid has evaporated. Meanwhile, in a medium skillet heat the butter and remaining oil over medium heat. Add the leeks and saute, stirring occasionally, about 3 minutes or until soft. Add peppers and continue sauteing for about 3-4 minutes or until cooked but slightly crisp. 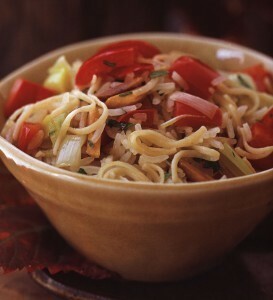 When rice and noodles are cooked, add vegetables, almonds, and parsley. Toss with a fork, taste for seasoning, and serve immediately. This may be prepared up to 2 hours ahead and kept at room temperature. Reheat carefully in top part of double boiler above hot water over medium heat for 10 minutes. To make this a vegetarian main course add sautéed tofu pieces and use vegetable stock. Make this into a cold salad the next day by adding some vinaigrette to the leftover portion. Cold shrimp or chicken pieces would be a nice addition. Try Autumn Noodles and Rice with grilled or roasted lamb, chicken, beef or fish.